Laphet, also spelled lakphet, lephet is fermented or pickled teal leaf, and it has a very long history in Myanmar. Thoke means salad. Myanmar’s national dish is a salad made of tea leaves. Teashops around Myanmar pour gallons of green and black tea every day yet half of the tea consumption is eaten not drunk. 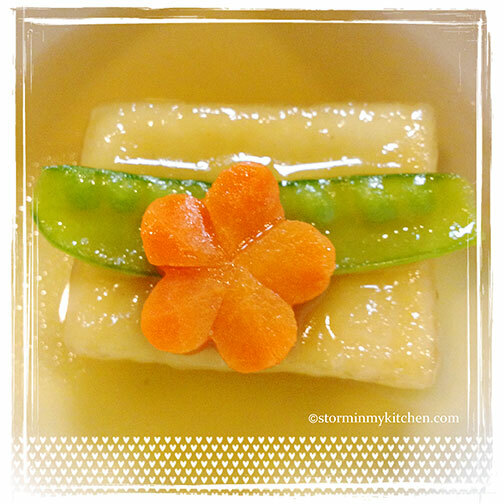 An extraordinary characteristic of its national dish is the delicate use of fermented tea leaves. The slightly bitter leaves are mixed by hand with shredded cabbage, sliced tomatoes, crunchy deep fried beans, nuts and peas, toasted sesame seed, crushed fried shrimp, a splash of garlic oil and slices of chili and garlic. It’s actually a versatile dish that can be eaten as a snack, an appetizer or with rice, a meal hard to miss when in Myanmar, actually. I instantly fell in love with it and prefer to take it as an appetizer – it has lovely textures and flavors that is umami, tangy, and savory in one mouthful. Myanmar culture is diverse and multi-ethnic and their cuisine is testament to it. My aunt’s kaffir lime tree bore fruits, but she usually lets them fall off because she only uses the leaves, she told me. 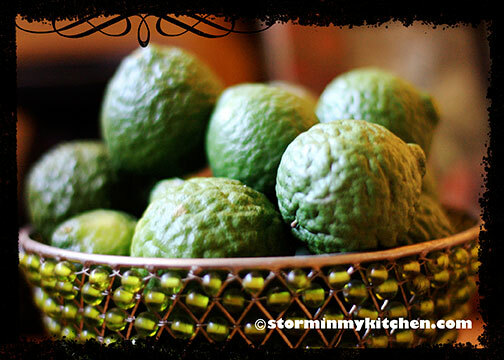 Thoughts of Thailand and Laos, most especially, burned in my mind, reminding me of the various dishes flavored with this heavenly lime. 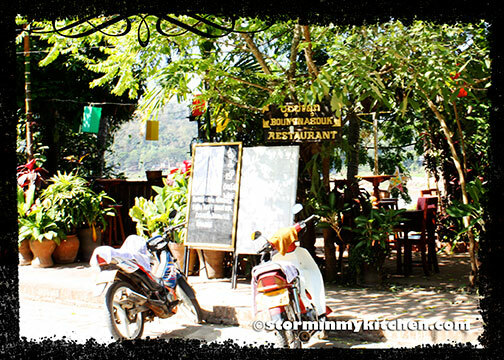 I spent a day learning Lao cooking at the Tamnak Lao Restaurant in Luang Prabang 2 years ago. Fun experience, but I haven’t had many chances of making the recipes at home because kaffir lime is usually needed and is often hard to come by. 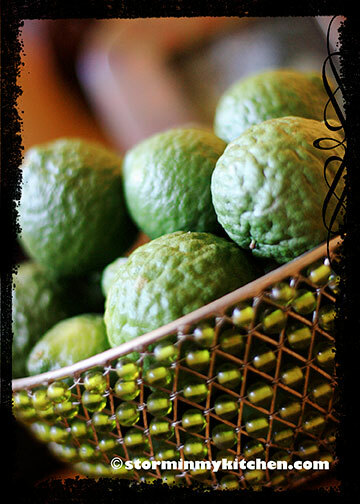 Sure I could use lemon or calamansi… but kaffir has a distinct strong tangy flavor that can brighten up a dish. “I could use some of those limes”, I told my aunt, suddenly missing the taste of larp. She sent me some and threw in some leaves too. Thank you Tita V.
Now I understand why she doesn’t use the fruit, most were dry. So dry, I had to use a few for this recipe. But it was worth it. I was back in Luang Prabang, in a sidewalk café having my larp with ice-cold Lao beer, the Mekong on one side and Indo-Chinese residences on the other. This is why I cook. 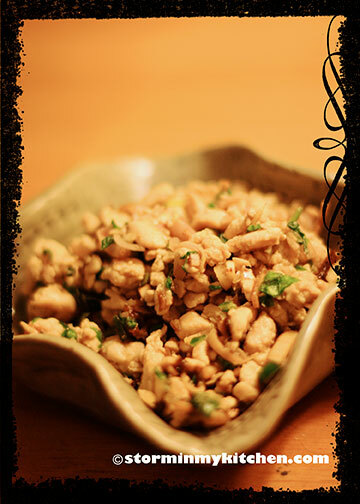 A very traditional Lao cold salad that can be substituted with pork, beef, fish and even tofu. 2 tablespoon banana flower finely sliced, rinsed well in water and drained. 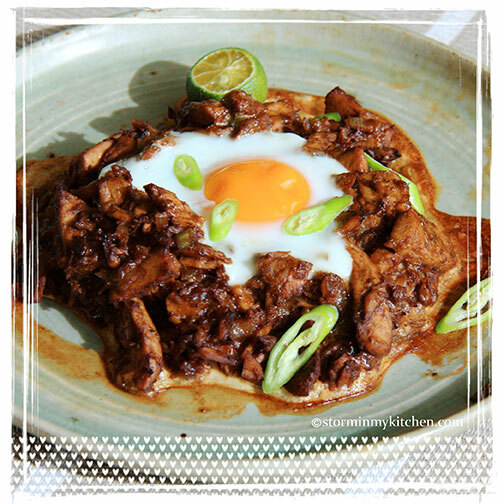 Put the pork or chicken stock, minced chicken, and half of the lime juice in a wok. Place over low heat and keep stirring until the chicken is cooked through and the stock is reduced. Transfer chicken in a bowl. Add the banana flower, kaffir lime leaves, shallots, garlic, coriander, lemongrass, and arugula leaves. Mix well. Add salt, rice powder, chili powder, fish sauce, fried garlic, and fried shallots. Mix thoroughly. Pour rest of the lime juice over the salad and give it a quick stir through. 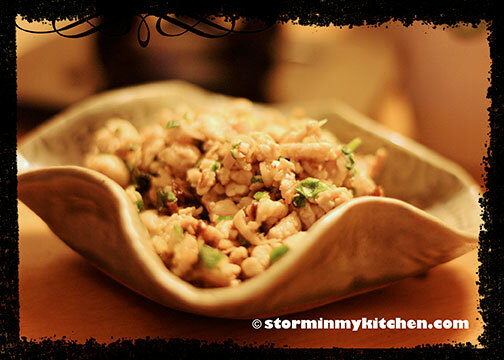 * Make your own rice powder by dry-frying raw sticky rice until it just begins to turn golden. Then whiz in a blender until powdery. Store in airtight container. ** If you can’t find fried garlic and shallots, make your own by slicing shallots / garlic very finely and deep-fry them until they turn golden. Store in airtight container. How have you been? I hope you have not abandoned me as I have abandoned this blog of late. It has been a wild few months in my real life lately… mostly work but I managed some very much-needed downtime out-of-town, the country even. The food I’ve encountered during my respite is unbelievable and share with you, I will… eventually. But for now, I owe the Kulinarya Club some sisig! A friend gave me a beautiful tuna belly from General Santos. Not as fresh as it came anymore as I had to throw it into the freezer while I was away. I have however, put it to good use on this month’s challenge, which I am co-hosting with Iska, by the way. So without further adieu, I present to you my version of Tuna Sisig. 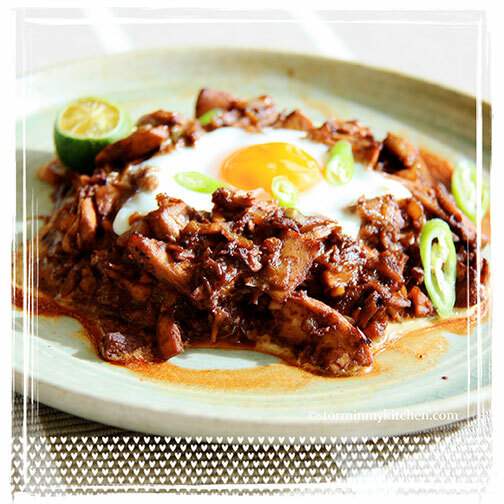 It really is pretty straightforward pork sisig recipe (which I have yet to make) replaced with tuna – I call it the healthier sisig. 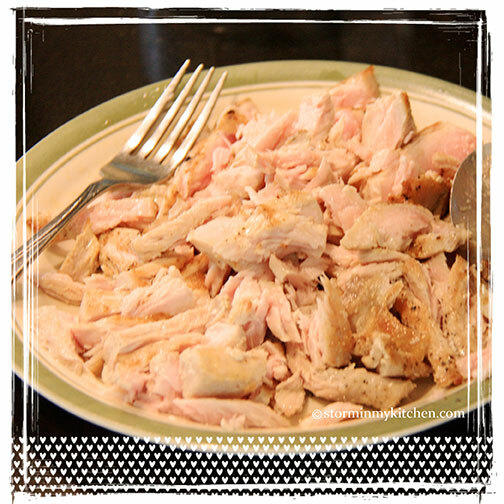 Fry tuna slices until slightly brown, drain on paper towel before flaking. In a wok, stir-fry garlic until fragrant, then add flaked tuna, liver spread, onion, stock, vinegar, soy sauce, liquid seasoning and green sili, cook for 2 to 3 minutes. Add the mayonnaise, stir and cook for another minute or until the liquids have dried out. Serve on a sizzling hot plate topped with an egg or serve on an oven-proof platter, make a well and top with egg (this is so the egg stays on top). Broil in oven at medium to high heat until egg white becomes opaque. Serve with calamansi. Wonderful with ice-cold beer, especially on an unusually hot day. It’s nearing the end of November, can anyone tell me why does it feel like summer still? 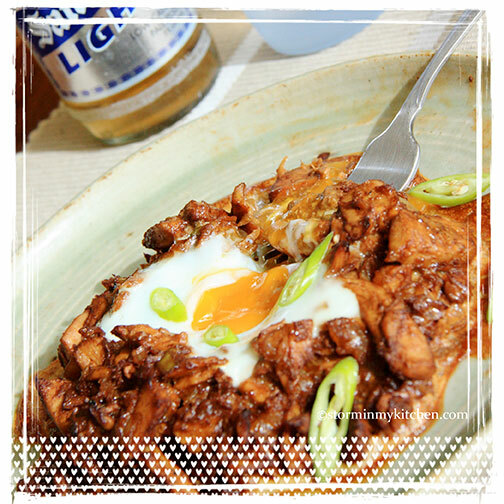 Kulinarya was started by a group of Filipino foodies living in Sydney, who are passionate about the Filipino culture & its colourful cuisine. When entertaining a modest sized group, say about 8-12 guests (more than that and I’ll need help in the kitchen), I like serving tapas. Many of the dishes would need very little preparation or cooking. I won’t have to slave it out in the kitchen and guests are given a variety to choose from. Load up on reds and whites and you’re good to go. A fun way to entertain and be entertained, if you ask me. I’d usually prepare plates of olives, 3-4 kinds of cheese – 1 hard like Manchego and/or a not so hard like Gruyère, a soft cheese like brie, and I usually go for a cream cheese spread like Boursin. These are great to go with Jamon Serrano and sliced baguette. Chorizo, rendered in its own oil, are always present in my table too. Include a few heavy dishes – a pasta salad or a meat dish perhaps – and this takes care of filling up the tummy. A friend sent me a box of honey dates from the Middle East. A nice snack it makes but I thought these would go better with bacon. 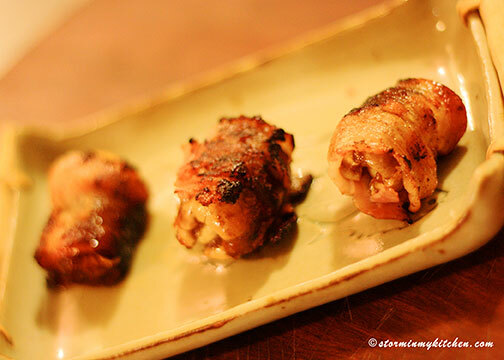 Bacon wrapped dates – I once had this in a tapas bar and fell in love with it. Served this as part of my tapas selection recently and my friends loved it too. This dish can be prepared ahead of time and cooked when guests arrive. 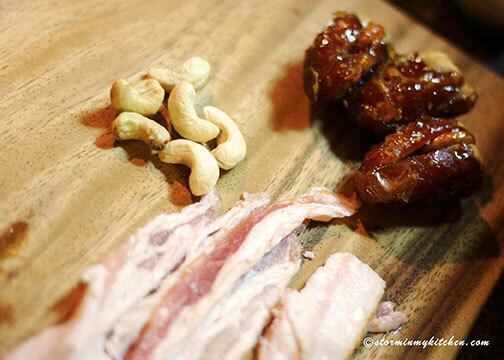 The dates that are soaked in honey while easily caramelizes the bacon (so be careful not to burn), gives that added sweet contrast that makes this dish a winner in my books. 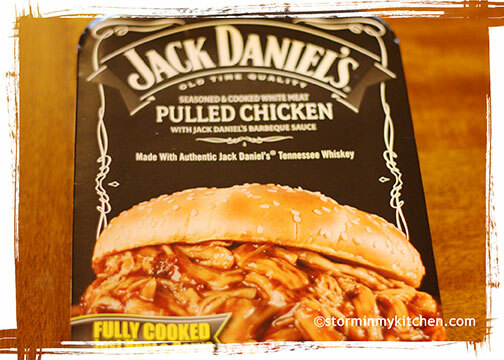 Sweet, salty with a hint of smoky aroma… Yum! Slice dates lengthwise on one side to remove the pit. 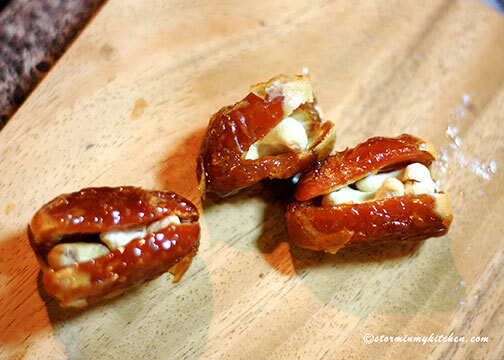 Fill the empty cavities of the dates with cashews. Push the sides together to close the dates up. 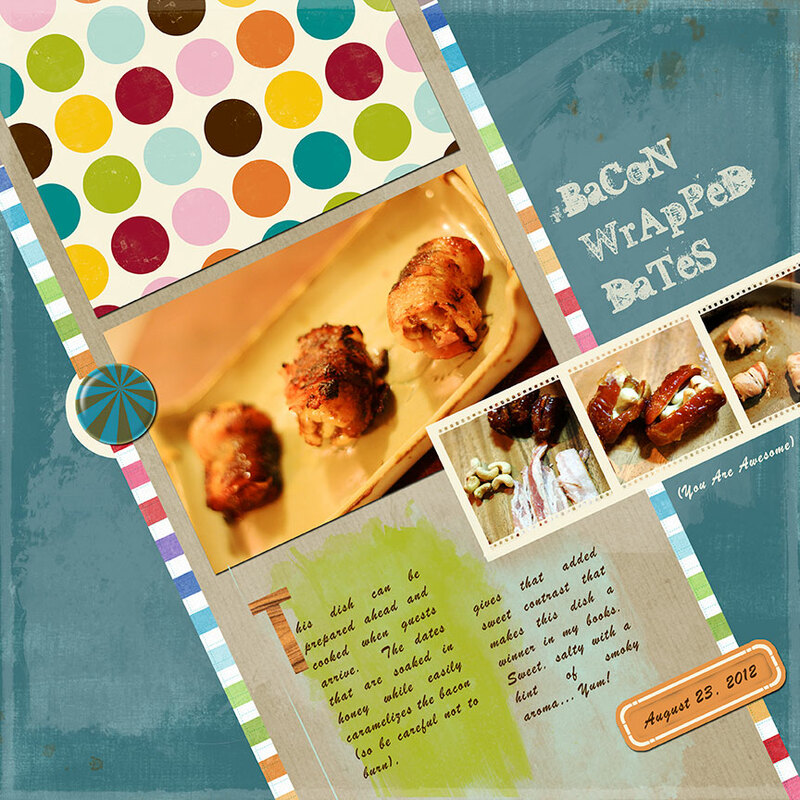 Wrap a slice of bacon around each date and place them seam side down. Heat a small flat pan, preferably cast iron, on medium heat. 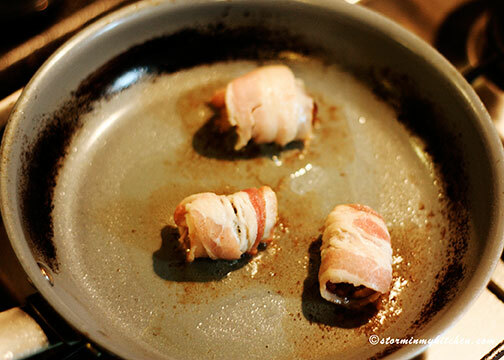 Place the bacon wrapped dates, seam side down on the pan until the bottoms are brown and the seam is sealed. Turn and brown all the other sides. Serve immediately. Every year, Christmas passes and stuffs your refrigerator with so much food. What do you do with all these? A friend’s solution to his “too much food” dilemma is to throw a party to serve all the cold cuts, cheeses, hams and wine he received over the holidays. A cool idea, don’t you think? Overwhelmed with the pile of food I have in my refrigerator, I noted to myself to eat at least half of what’s in it before I leave for a trip next week. Not an easy task really, but I shall try. Knowing that I love pulled pork, my US-based cousin home for the holidays, brought this for me. She said the pork was not available but this was just as yummy. I usually have them the traditional way – on a bun but I didn’t have any. 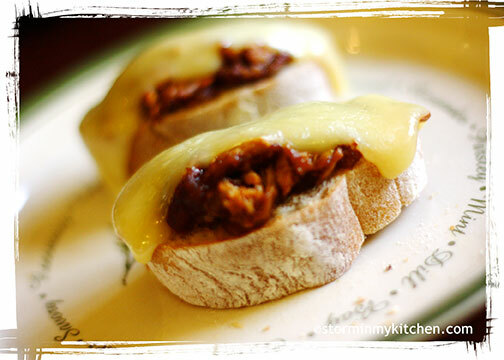 I made Pulled Chicken Melt instead with leftover Fontina on sliced ciabatta bread. 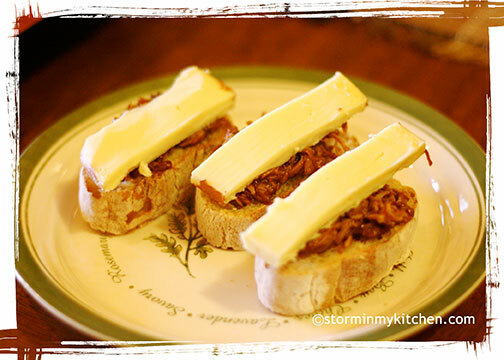 A few minutes in the toaster oven, just to melt the cheese and lunch is ready and yummy to boot. How easy is that? 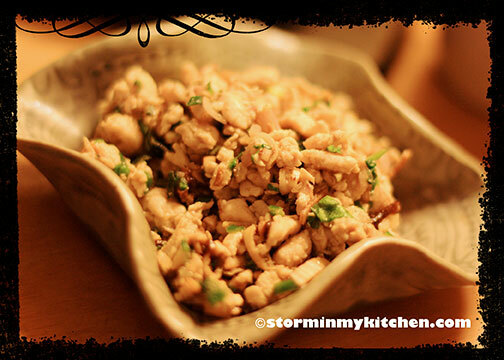 You are currently browsing entries tagged with Appetizer at Storm In My Kitchen.